Look at that punim! Would you cast this face as a lead in a major motion picture? Zack Pearlman backstage as Cousin Kevin in Tommy (2006) | Zack’s winning audition headshot, which I took in 2007. 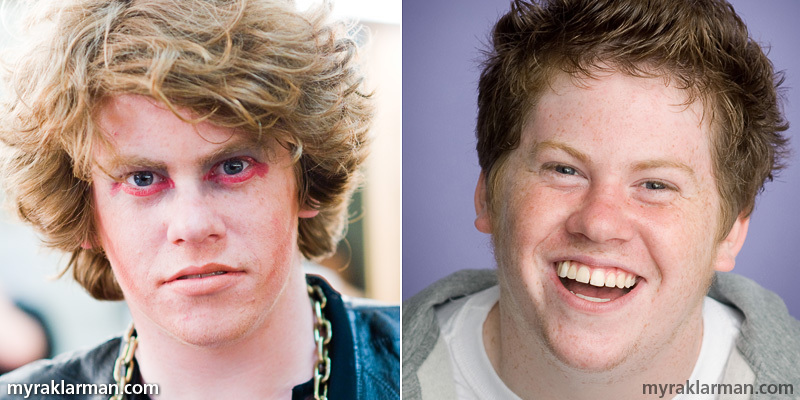 Ann Arbor’s own Zack Pearlman is appearing in his first ever movie. The term “movie” doesn’t quite do it justice, as it’s actually a major Hollywood motion picture produced by Will Ferrell and Adam McKay. And Zack doesn’t merely make an “appearance” in this film either — he damn well stars in it! In fact, his character is the “filmmaker.” Shot hand-held, the film comes across more as crafty home movie than as mockumentary. It’s called The Virginity Hit. And, as you might glean from that oh-so-subtle title, it’s a movie about the characters navigating a certain rite of passage. Sounds like a crude teen comedy, right? And, to my dismay, the trailer played up the “crude.” Even though I’m pretty sure the trailer wasn’t targeting my particular demographic (I’m a 40-something mom), I was beginning to worry about whether I’d (even remotely) like this flick. But I attended a preview screening last Thursday at the State Theatre, and I can tell you that the movie is hilarious — I loved it. To be sure, there’s the requisite dose of off-color material and misguided youth doing misguided things. But it’s also endearing — I found, to my surprise, that I actually cared about the main characters. And I laughed a lot. I have been proud of Zack for a long time, so I may be biased, but I wholeheartedly recommend The Virginity Hit. Let’s help this movie get a wider distribution! I encourage you all to come out to the premiere this weekend to see the movie. Not just because it’s cool to support a homegrown actor’s first movie, but because you’ll be rewarded with lots of laughs. And also, by the time Zack is entrenched as a bigtime Hollywood producer, my Max will be ready for a leading role in his own teen-sploitation film! So, what’s a nice guy like you doing in a movie like this? Exploiting how teenagers really act [laughs]. The movie is not as raunchy as one might think. It’s actually a very good movie — full of heart. It explores a lot of conflicts that teenagers deal with when they have social pressures to lose their virginity. Your character is portrayed as making the movie about himself and his friends on this adventure, and I was impressed with how real it seemed — both the friendships and the filmmaking. One of the reasons this movie is going to feel so real is because we capture the real thing. There was more than a year between the time Matt Bennett and I got cast and when shooting began. During that time, we became best friends. They put us — the four main guys — in a huge house together instead of in hotel rooms. It was like a party every single day — it was so much fun. And I was instructed to always shoot video. A lot of that footage wound up in the movie. I think we’re all dying to know: how’d you get this gig? It started with a contest on Funny or Die called Project X, where anyone could submit a video of their most embarrassing story for a chance to audition for the movie. [Zack then describes the video he submitted. But, to paraphrase Doug Neidermeyer, decorum prohibits quoting him fully here.] The next thing I knew, I received a phone call from a casting director in NYC (Barden/Schnee Casting). I spent the remainder of my Bar Mitzvah money flying out to NYC for the audition. And then I got the callback! They flew me out to LA for a final audition — the “chemistry read” with Matt Bennett, who had already been cast. How are you similar to your character? Like my character, I care deeply about my friends. I’m there for them when they need me, but I don’t get so involved to the point that I’m spearheading schemes to fix their problems. What prior acting experiences helped you with the movie? The improv I did at Pioneer [Comedy Troupe] definitely helped me. I love improv comedy. Longform improv is a growing art because of the Apatow films and the Will Ferrell / Adam McKay films. I’m in the Upright Citizens Brigade, which is an improv theater that specifically does longform improv and teaches it. If you want to do comedy, start doing longform improv. How much of the final movie was scripted versus improvised? I’d say 95% of the movie is improvised. We’d start with the script or the context of the scene, and then we’d do 1-2 really long improvised takes. Any “homages” in the movie? My favorite actor is John Belushi. I made up a t-shirt that says “High School,” that I wear in the movie to emulate the “College” t-shirt Belushi wears in Animal House. I’d say being in high school today is like how college was then. How do your parents feel about your success? They’re excited for me. But they’re cautious, too. They understand as well as I do that this town [LA] is very deceiving. Never get comfortable because the industry is always changing. And you have to be willing to change with it. In that respect I’ve taken the opportunity to try different avenues like writing, directing, and producing. Giving everything my all. I just wrote, directed, and starred in a pilot that we’ll be presenting in the next few weeks. Matt (my co-star) and I have our own production company, and we’re writing a movie. Can’t talk about these projects in detail yet. Stay tuned. What’s your advice for getting into show business? There is no secret to success in show business. I happened to be right for the part, and I seized the opportunity. Go to UCB [Upright Citizens Brigade], move to a big city like NY, LA or Chicago, start improv classes. UCB’s rate of spitting out people who are on TV shows or write for TV or even direct is phenomenal. So my advice is really simple: just start. Start doing improv classes. Start trying to get your name out there. Once you get through Improv 401, you hit a point where you’re performing all the time around town. You’ll start getting into that community, and who knows what happens from there? That’s my advice: just start! You got your start acting in Ann Arbor. Which local theater groups did you work with? This town gave me so many opportunities — I am very, very thankful for that! I was involved with the Burns Park Players, Young People’s Theater, Tappan Players, Pioneer Theatre Guild, Pioneer Comedy Troupe, and Ann Arbor Civic Theater. What was your favorite role from back in your Ann Arbor musical theater days? The most fun I ever had was Woof in Hair [Pioneer Theatre Guild, Fall 2005]. I was very into that mentality at the time. Very hippy, trying to fight the man. I also had long hair. It was such an acting adventure for me. I was playing someone young who I liked and admired. And also Cousin Kevin in Tommy [Pioneer Theatre Guild, Spring 2006]. That was such a dark and weird character that I got to experiment with. I was just reviewing the photos I took of your Tommy performance. You looked so fierce! I have gained a lot of weight since high school. Meaningfully, though — I meant to. I realized something about comedy that more people laugh at fat guys than skinny guys. Except Matt Bennett is unbelievably funny, and he’s skinny. I’d do the social experiment of losing weight to see if I’d still be funny. What’s something that nobody knows about Zack Pearlman? I played video games [Counter-Strike] professionally for 6 months. I went around with a team and we got paid. Pretty lame. I gained a lot of weight doing that. See you at the premiere this weekend! How exciting! Beautiful portraits, Myra, and many congratulations to Zack- I’ll look forward to seeing the movie! Great little retrospective Myra, thanks! Mazel Tov to Zack and his family! I enjoyed reading the commentary and I so look forward to seeing your movie … I remember you as a toddler way back when and you still have that twinkle in your eye and that mischievous grin.